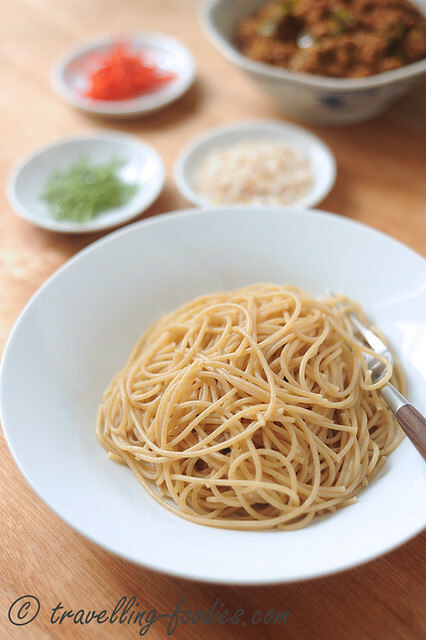 I’d used a packet of organic spaghetti which I’d gotten a few months back as a sample try out. 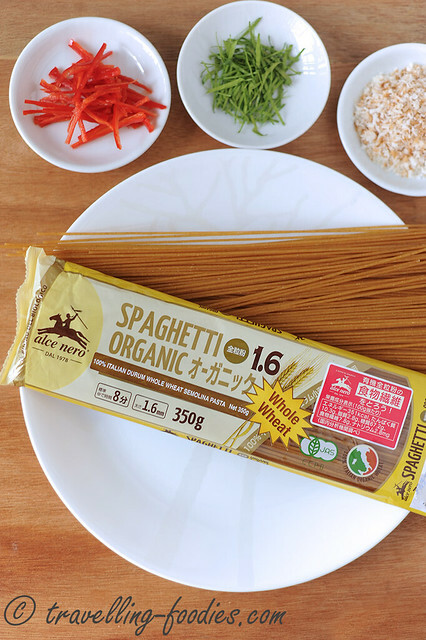 It is from Alce Nero, a new brand of pasta that is hitting the market. Made in Italy, it seems to be targeted for the Japanese market as well. The aroma from the wheat was very apparent as I cut open the packet. Far more so than the other brands of pasta which I’d tried before. Looks promising indeed. 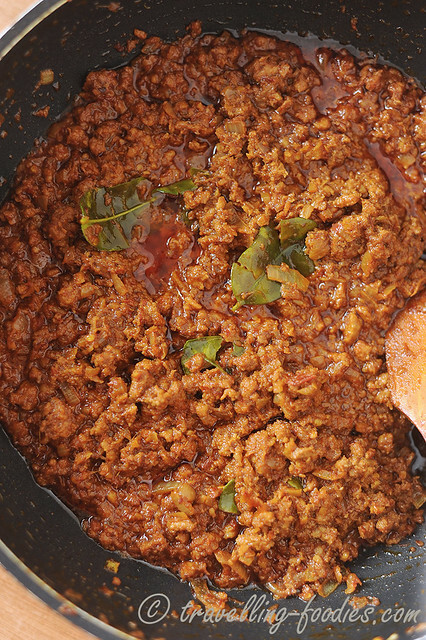 Like I’d mentioned, cooking the minced meat rendang takes only a fraction of the time compared to stewing huge chunks of meat the conventional way. About 30 to 40 min or so, the rendang using ground beef is basically done. I would imagine that using ground chicken would be much much faster than this! That said, the other ingredients are not compromised, using a generous portion of my generic rempah which I always have ready frozen, kerisik, gula melaka and not forgetting kaffir lime leaves, our way of cooking rendang compared to the conventional tumeric leaves. Those the pasta from Alcer Nero was several shades darker in hues compared to the other brands when it was just of the packet, the colour lightens considerably when it is cooked until al dente. The text on the packaging isn’t that clear on the cooking time needed but I basically followed the conventional way of cooking dried spaghetti, i.e. 12-13 min over in a pot of boiling water and a small pinch of salt. It worked well. 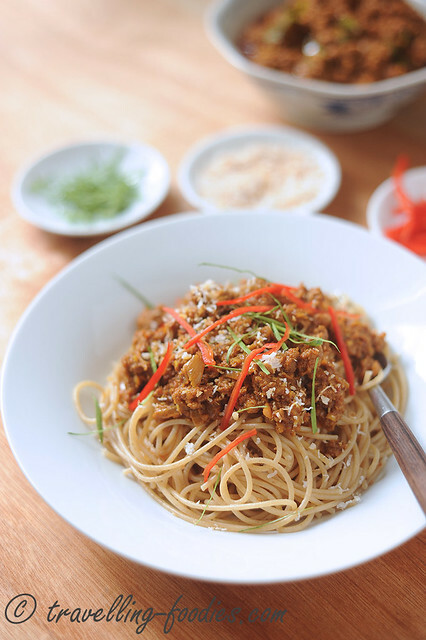 After the spaghetti is cooked, all that is left is the assembly which is as simple as scooping a generous amount of rendang daging kisar over the freshly cooked spaghetti and garnishing with sliced chilies, julienned kaffir lime leaves and kerisik for that extra oomph of flavours. Selamat Makan! To cook the rendang daging kisar, first add cooking oil into a heated wok. Add diced onions with a small pinch of salt and saute until translucent. Add generic rempah and stir fry until fragrant. Add ground meat into the wok and use a spatula to break it up into smaller bits. Add coconut milk, kaffir lime leaves, gula melaka, salt and stir thoroughly to mix well. Lower flame to medium low and simmer for 30-40 min until the meat is thoroughly cooked and tender. To cook the pasta, add pasta to boiling water with a small pinch of salt and cook as per instructions on the packaging. Drain the pasta when it is al dente. 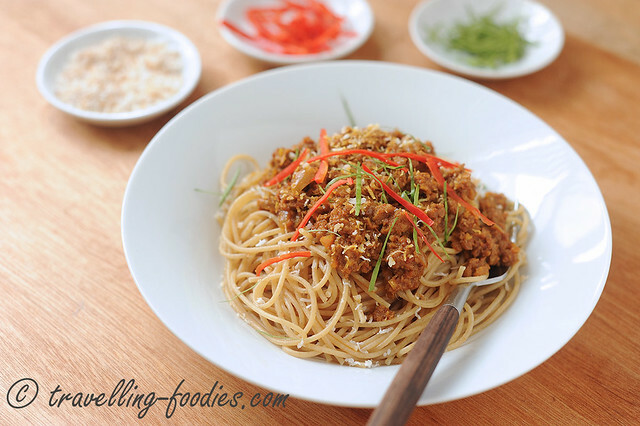 Portion the pasta into individual plates and scoop a generous portion of rendang daging kisar over the noodles. Garnish with sliced red chilies, kaffir lime leaves and kerisik. This entry was posted on October 8, 2015 by Alan (travellingfoodies). 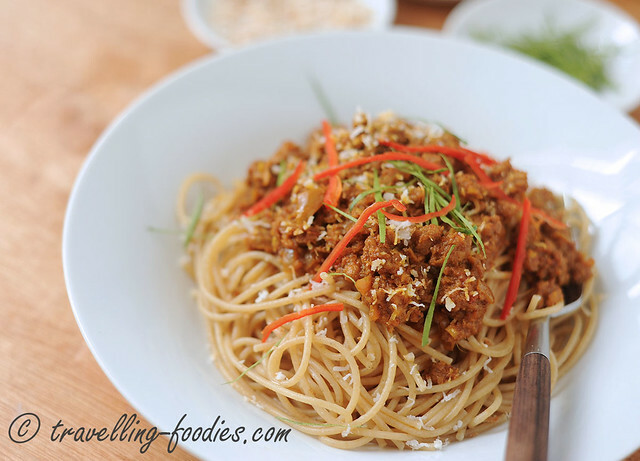 It was filed under Food, Simple Eats and was tagged with daun limau purut, fusion, ground meat, italian, kaffir lime leaves, kerisik, malay, minced meat, organic pasta, pasta, red chili, rendang, spaghetti, Spaghetti Rendang Bolognese. Yes this pasta is a tad darker than the usual and the texture is good. I think I took approx 8-10 mins to get it done. And I love your fusion pasta. I shall try it some day.